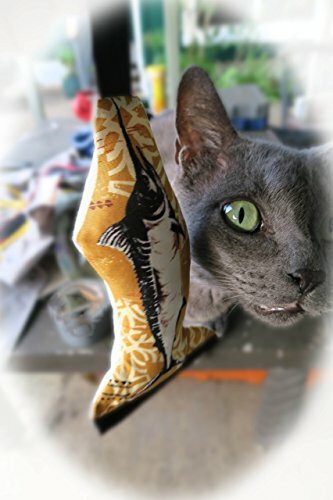 Hawaiian Popoki (cat) toys - filled with catnip and fabric stuffing Have some fun with your best friend! Let them play with the Aloha Spirit to make up for leaving them at home alone Sturdy vibrant canvas fabric on the back and 100% cotton front Set includes Ulua and Marlin....let your Popoki catch them all featured on vintage Hawaiian fabric front and sturdy canvas textured back and a stretch hoop to hold and let it bounce Quality catnip filled (Kong Natural Premium Catnip grown in North America) What do you mean you went all the way to Hawaii and didn't bring something home for your Popoki! Auwe (shameful) ;) Made in Hawaii Make your Cat feel SHAKA COOL! If you have any questions about this product by Ikapela Designs, contact us by completing and submitting the form below. If you are looking for a specif part number, please include it with your message.